Whenever I start talking about cucumber varieties, people give me that look that says, You are weirder than I ever imagined. Why isn’t cucumber breeding a more compelling subject? A gardener can introduce every tree and shrub in the yard in mock Latin, and nobody blinks. Ordinary people talk about rose breeders by name. But what vegetable gardener hasn’t suffered with disease-ridden cucumbers, bitter cucumbers, cucumbers that blow up like balloons before they reach four inches long? What cuke grower hasn’t felt frustrated by inaccurate catalog descriptions and a single photo standing in for several varieties? Why don’t we dirt-scratching picklers compare notes more often? For pickling, people tell me, you use Kirby cucumbers. I have never planted a Kirby. I have never seen a seed packet labeled Kirby. I guess there must once have been a cucumber variety called Kirby, but I’ve searched and found no record of it. Parisienne Cornichon de Bourbonne. Slim as a cigarette at three inches long, this many-prickled cuke can grow to more than seven inches long without bloating. The only current U.S. source I’ve found for this classic French cornichon variety is Kitchen Garden Seeds. Vorgebirgstrauben. Like Cornichon de Bourbonne, this German pickling cucumber is covered with tiny prickles that rub off easily. But Vorgebirgstrauben is much thicker than its French cousin and so is best used at no more than four inches long. The only current American source I’ve found is Reimer Seeds. Agnes. I bought seeds of this Dutch variety at the recommendation of Rose Marie Nichols McGee of Nichols Garden Nursery. With unfurrowed but heavily prickled deep-green skin, this new, hybrid sausage-shaped cucumber is unconventionally handsome. For pickling, it is best used at about four inches. The fruit is never bitter, although for some reason it seems particularly susceptible to damage by bitter-loving cucumber beetles. Disease-resistant and said to produce well in cool weather, Agnes is available from Territorial as well as Nichols. County Fair. This deep-green, warty, arrow-straight hybrid cucumber grows on a vine that’s quite productive in my garden. Some seed companies say County Fair is three inches long, others eight or ten. The fruit can reach any of these sizes, of course, but it doesn’t seem properly filled out until it reaches about 4½ inches, so I recommend it for people who like long pickles. It’s also an excellent slicer for salads. County Fair is disease-resistant, self-sterile (and so seedless if planted apart from other varieties), and never bitter. Many seed companies carry this variety. Alibi. Recommended by one of my readers, Alibi didn’t get labeled in my garden; I think I forgot to plant the Alibi seeds at first and then very scientifically slipped one Alibi seed into the pot for each hill. But the cucumber you see pictured here, labeled with the question marks, fits the more reliable catalog descriptions. This pale-green hybrid cuke, warted in the American style, is tapered at either end and so is prone to bloating, but it’s excellent for pickling at two to four inches long. The most prolific variety in my garden this summer, Alibi is available from many seed companies. For perhaps the first time, not a single cucumber vine in my garden has prematurely died this summer. All the pickling varieties have produced well, and we’ve tasted only two bitter cucumbers. This success may be partially due to mild weather, spun polyester row covers, and interplanted marigolds, whose stink truly does seem to fend off cucumber beetles. But my careful choice of varieties has no doubt helped. 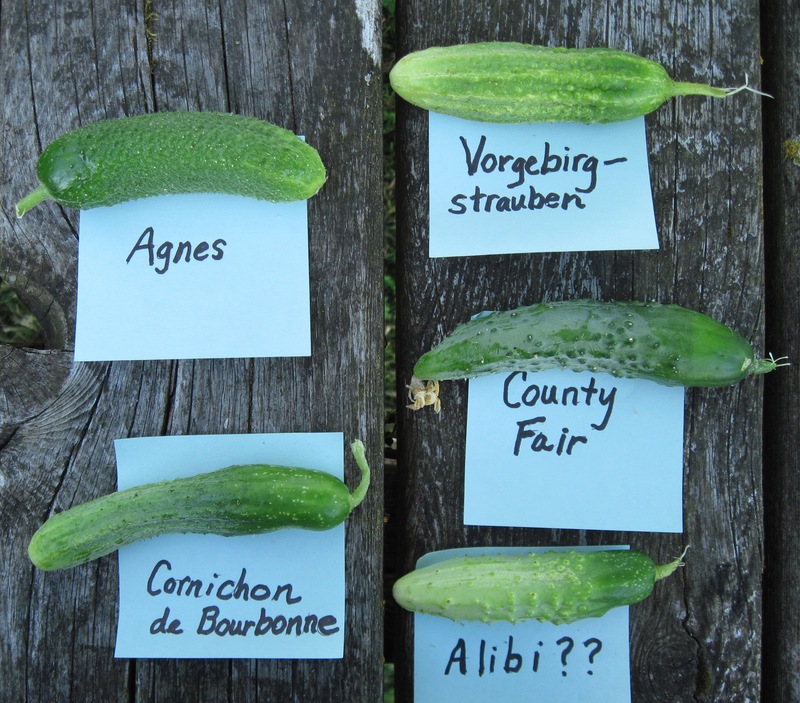 This entry was posted in Pickles, Vegetables and tagged Agnes, Alibi, cornichon, Cornichon de Bourbonne, County Fair, gherkin, Kirby, pickling cucumbers, Vorgebirgstrauben. Bookmark the permalink. Your de Bourbonnes are slimmer than mine, mine did bloat but I found them to be good slicers (once you rub the bristles off) if they got away from me. I’m embarrassed to say that happened quite often this year – I only got to make 1 quart of cornichon pickles. I found Little Leaf H19 to be a good pickling variety (also good for salads), though sadly it was not immune (only resistant) to downy mildew. Picklebush didn’t produce as much as Little Leaf did, and the fruit grew twice as large in diameter than Little Leaf, though they didn’t get any longer. I don’t know what the “pickling cucumber” I picked up at a nursery was (maybe the elusive Kirby LOL?) but they tended to have “waists” which didn’t make them very attractive. I’m definitely planting Little Leaf again, I still have seeds for de Bourbonne (bought from Fedco last year so there’s another source), and I have heard good things about Diva as well as County Fair so I may try those next year. Thanks for the report. Here’s the link to the cornichon cucumber on the Fedco website: http://www.fedcoseeds.com/seeds/search.php?item=1222&index=0&listname=Cucumber&amp;. I haven’t tried Little Leaf, but Picklebush has never done well for me. We used Alibi this year and I have made bucket after bucket of your Lower East Side full Sour Dills. Not sure what I am going to do with them all. They line the shelves of on of the little refrigerators. I found that the Alibi pickling cukes did much better than the marketmore cucumbers that we also planted. I have about a dozen jars of bread and butter pickles and right now, I have a refrigerator drawer full of both types of cukes with lots more on the vines. I have had a slight problem with a couple of the vines dying off but they were still producing. I am planning on using the Alibi again next year. Our garden is a square foot raised bed garden and all of our cukes, melons, peas, beans are grown on trellisis. Our zucchini is staked so it grows upright. I recently bought a little refrigerator to fill with pickle jars, and I turned the temperature too low. What a fine smell and big mess in our garage last night after a frozen pickle jar broke! My cucumbers got a slow start this year and didn’t start really producing until a couple of weeks ago. I bought seeds from Botanical Interests but they didn’t specify the variety. I bought a larger plant at the farmers market to supplement and it was only labeled “pickling” as well. Maybe these are the phantom Kirbys? Thanks for the information on pickling varieties. I’ve been interested in trying new ones but Botanical Interests, my go-to seed source didn’t specify varieties (which is odd for them since they promote heirlooms and open-pollinated seeds). I’d always heard that planting more than one variety in a single garden caused problems with cross-pollination. You haven’t found that to be the case, I take it? I’ve saved seeds of non-hybrid cucumbers for many years, and I’ve had very little apparent crossing although I always grow several varieties close together. Parthenocarpic varieties, originally developed for greenhouse production, are seedless provided they are isolated. Some people think that cucumber seeds make them burp. I just noticed (bought the seeds last year so forgot) that the Fedco site said the de Bourbonnes weren’t spiny. Not the case! These things are spiny even when they get big. Just wondering if maybe they sent me the wrong seed? Cross-pollination is only a problem if you’re saving seed. I’ve grown these cucumbers for many years, and they have always been spiny–so spiny that my children wouldn’t pick them. Maybe Fedco means that the spines, though numerous, are very small, and that they rub off easily. I’m growing alibi for the 2nd year. They seem to grow reliably, stay in good shape through the season and don’t get bitter. I use them for both pickles and salad. This year I’m trying Mexican sour gherkins from seed (my transplants died). Hopefully I’ll actually get some before the growing season is over. I’m growing Mexican sour gherkins, too. They’re doing much better this year than last, and today I plan to pickle some. I’ll take a photo and post it if I have a chance. I’d love to know where you got the sour gherkin seed. I believe I got my Mexican sour gherkin seeds from Seed Savers Exchange, but both Nichols and Territorial also have them. I really enjoyed this post. This year I grew Jackson Classic which Johnny’s used to replace Alibi. I was not impressed — vines died early and were not very productive. It’s a smaller vine than Alibi and the cucumbers have a uniform shape — that’s all the good I can say about it. I’ve grown Harmony for 2 years and find it to be prolific and disease resistant — it does tend to get bulbous. Little Tike is very prolific, but is really thin-skinned and gets seedy unless picked small. The only Cornichon I have tried was a big disappointment. The cucumbers were only good for about a day and I never got enough at one time to pickle. Judy, thanks for the report on three varieties I’d never even heard of before. I think it’s worth making cornichons even if you can gather only a cup of cucumbers. How many of such sour pickles can normal people eat in a year, anyway? I enjoyed reading about your experiences with these varieties; very valuable. Can you talk a little about cuke growing culture. I have had very mixed results in the past with die off being the biggest problem. Also, how do you calculate the number of plants needed to produce enough fruits for pickling and have enough ready at about the same time? (No planting this year because of an extended trip) Thanks! Three or four productive plants should be enough, I think. Cucumber plants don’t like their roots disturbed, so plant seeds directly in the garden if your season is long enough, or transplant with great care. The plants need plenty of compost and, especially, warm air and soil. Planting on slightly raised mounds helps warm roots. Black plastic and floating row covers may not be ecological, but they retain heat well, and they also protect plants from disease-spreading cucumber beetles. Marigolds seem to help fend off the beetles, who are less attracted to bitter-free varieties. I have planted a variety called “Diva” for a couple of years now (one packet lasted me a while!) and have really liked it for pickles even though I don’t think it’s actually a pickling cucumber. It has a really good flavor and it gets plump for its length (so it makes a short but fat pickle). It stays sweet even at large sizes so the ones you don’t catch at the pickling size are still good. I grew both Diva and Summer Dance this year for eating (not pickling). They are great for that purpose, but I would be a bit cautious about pickling them. Last year I had such a surfeit of Summer Dance (and because they were so beautifully shaped) I picked some. My experience is that they work pretty well for B & B type pickles. As dill chips I thought they were too soft even with pickle crisp. I used my Diva cucumbers for making nuka pickles last year, and liked them a lot for that purpose, but this year we’re just slicing them for salads. Thought some might find this article interesting – I eventually lost all my cucurbits to DM this year, even the Little Leaf which was supposed to be resistant. Maybe I had this new strain of DM? Thanks, Sheila. I’m happy to hear about the grant. Gardeners and farmers both need robust open-pollinated varieties! I grow little leaf too, after a few years of bad luck I went for genetics to help 🙂 They can be grown under row cover entirely, though they usually get too big for mine eventually. I like how prolific they are in a smallish patch, and their size/shape for pickling is ideal. I also have telegraph for long salad cucumbers (which make great Asian fridge pickles), and lemon, though I’ve only had one measly fruit so far, no luck with those at all! Jeremy, that’s a nice article you wrote. Asier doesn’t look like the sort of cucumber you’d brine. In fact, the word asier seems to refer as much to a sort of pickle as a sort of cucumber, and that sort of pickle is a mustard pickle, called Senfgurken in German. There’s a recipe for Senfgurken in The Joy of Pickling.Your etymology may be correct, because in much of the world words like achar refer to mustard pickles. Here’s a link to a Danish article on asier agriculture: https://www.landbrugsinfo.dk/Planteavl/Havebrug/Frilandsgroensager/Sider/gr_oko_dv_asieagurk.pdf?download=true. The article lists three varieties of asier cucumbers: Dansk Asie (an old variety, hardy, striped, now rare), Langelands Kaempe ‘Gigant’ (grown in Langeland, large, cylindrical, smooth, dark green, susceptible to mildew), and Fatum (a recent German variety, smmoth dark green medium length, bitter-free). You can get Fatum from Amazon.de. You can get Dansk Asie from this supplier: http://www.vaegtkonsulenterne.dk/Slanketips/Sundhedsleksikon/asieagurk/. At least I’m guessing that you can get seeds from these sources, since you’re in Europe. I don’t know of any U.S. sources. If you succeed in getting seeds, will you send me a few? Your comment has been so helpful and fantastic by the way. Thank you. until they were yellowing, didn’t have to be peeled for salads, and were equally nice fresh or brined (I’m still enjoying NY Sours from my short growing season!). Other seed companies show a Green Fingers variety but I have no idea whether it’s the same or not as they refer to a much longer fruit. In a quick Web search for Persian Baby Green Fingers cucumber seeds I found one other source, Rohror Seeds, but Rohror’s supplier is apparently Renee’s. Whereas most Persian cucumbers are picked at 4 to 6 inches, Baby Green Fingers is picked smaller, at 3 to 5 inches. I don’t know if I’ll ever try growing Persian cucumbers, which are much loved in California for their smooth, thin skins and sweet, crisp flesh, because this variety is developed for warm, arid climates. Sherri, where do you live, with your short growing season? Sorry, I didn’t see your response to my post until just now! I live in The (currently ice covered) Berkshires, zone 5 but high enough for a shortened growing season. The Persian Baby Green Fingers have continued to do well for me every year without a whole lot of help on my part. I’ve been fermenting them, from tiny cornichon size at the end of the season to 7″ long when I’m lazy about picking, and find them bloat free and crunchy. They also taste great fresh, have no seeds, and don’t require peeling. I just thought it would be fun to add a new variety so thought I’d see what your favorites are. Sherry, it’s good to know that you can grow Baby Green Fingers in a place as cool as the Berkshires. I’ll have to try this variety. Sherri – I’m in the Berkshires too! If Linda doesn’t mind me posting my page here, you can contact me through Facebook at Briarwoods Farm. I don’t know if I can get seeds for Baby Green Fingers this year but I’ve got some other kinds I’m trying. Little Leaf didn’t do extremely well for me last year but we had a lot of SCB. I’m doing a massive crop rotation this year. Linda, how was Italy? Help! How do we manage the terrible spines on the Agnes for pickling? My husband is ready to throw the whole lot out rather than deal with them! Melanie, Agnes cukes have a lot of prickles, I know, but they are tiny and harmless. Can’t you quickly rub them all off, or else ignore them? If you’re truly dealing with “terrible spines,” are you sure your cucumbers are really Agnes? Apparently Norval Kirby introduced up to 9 different kinds of cukes starting in 1920. By 1930 they had begun to be replaced by National Pickling Cucumber. Kirby cukes are in the 3 – 6″ range. The phrase seems to denote a short pickling cuke now rather than a specific variety now. Thanks, Tina. Sometime after writing this post I managed to uncover some history of Norval Kirby. It seems that the cucumber for which his name became known was Kirby’s Stays Green. It was described in ads as white-spined and about 7 inches long. I figured it must have been sold half-grown for pickling. Do you have details on any of his other varieties? Quite by coincidence this post sprang back to life the very morning I went out to buy my cucumber seeds. (I never did get any asier cucumbers because I garden in pots on the terrace rather than open ground.) I found the Small Green Parisian Pickling I was looking for, but no indication of whether it will climb or form a bush. A quick search turned up one person who says it grew up a trellis, which is what I need, but not definitive information. Do you happen to know? Parisian Pickling is a cornichon cucumber, slender and without warts but with many tiny spines. If the plant is healthy, it will sprawl far and wide. Sprawling is out of the question! I am going to have to entice it up a trellis. Usually, I grew “petit vert de Paris” (small green from Paris) or ” fin de Meaux” (slim from Meaux), two French varieties (I’m from Belgium, so it’s regional varieties for me). They are vines, early, happy with mild-temperate climat and produces lot of small fruits (about 1,5 – 2 inches long) best for traditionnal sour pickiling (without sugar added). I used also “vert de Paris” between 3 and 4 inches for sweeter pickling (= cornichons à l’aigre-doux) but seeds are often a little too present at this size. For Russian and Polse recipes with brine and sometimes vinegar (like “malassol”), I grow “Keizer Alexander”, a russian brown variety, also a vine. Very productive, young fruits are good for pickling but also sliced in salad. Mature fruits have seeds but are enough good in salad and store really good for the winter (easily two months). This year, I’m trying German variety “Vorgebirgstrauben” and also a variety without cultivar name but describes as “perfect for Polish cucumber pickles”. Line, thanks for writing. I see that Fin de Meaux seeds are available in the United States from Baker Creek (www.rareseeds.com). As far as I can tell from a quick search, Petit Vert de Paris seeds aren’t available here, but perhaps this variety sometimes goes by another name. Kaiser Alexander is an unusual cucumber, described as sweet, never bitter, and ripening brown with netting. Related to it are Sikkim and Poona Kheera, both available from Baker Creek. Kaiser Alexander has been sold in the past by Amishland Heirloom seeds (www.amishlandseeds.com) and is currently available from A’bunadh Seeds (abunadhseeds.com) in Alberta. Line, it’s interesting to me that you’ve used the Kaiser Alexanders for malossal (Russian for “little salt”) pickles. Do you use them young and whole for this purpose? How long do you ferment them? I purchase and have had good success every year making garlic dills with “Endeavor” by Renee’s seeds which are supposed to be one of the same of Kirby. I enjoythe depth of your blog. According to Renee, Endeavor is a productive and disease-resistant hybrid “Kirby” (that is, warty pickling cucumber). Endeavor sounds worth a try! I was looking to order a whitish Kirby and the Vorgebirg or the alibi pictures come close to what I know as the cucumbers I know from tropical Suriname , South America (DMS Decimal	5° 50′ 0″ N, 55° 10′ 0″ W). The taste is very refreshing and we used to pickle the big cucumbers with the thick white seeds. Does anyone know which cucumber comes close to this description? The bitter taste is when temperatures are high. The cucumber has to be prepared to be edible. Cut a slice close to the stem only and rub the cucumber until the bitter liquid (looks like white foam) comes out. Repeat cutting a slice 2 or 3 times) until there is no more liquid. If you cut a green house cucumber you see the drops on the cut surface appearing. Kirby Cucumbers is now a generic term for any small cucumber sold for pickling. … Kirby Cucumbers are sold fresh with skins unwaxed, because waxing would interfere with pickling. They are very crisp, because their seed cavity is so small and undeveloped, which also means they have fewer seeds than other cucumbers. That’s right, Robin. Sometime after writing this piece I tracked down the origin of the name (perhaps with the help of a reader of this blog, though I don’t remember now). It comes from Norval E. Kirby, a partner in the Philadelphia seed company I. N. Simon and Son. While walking through a field of cucumbers in about 1920, Kirby spotted what he felt was the perfect plant, with fruits that were dark green, white-spined, and about 7 inches long. From this plant his company bred Kirby’s Stays Green, which was for decades a favorite among market gardeners. They or their customers must have preferred the fruits half-grown, because 3 to 5 inches has long been the preferred size for American pickling cucumbers. I have always grown National Pickling and Sumter varieties for several years now both pickling and fresh eating. They are both are known as heavy producers with good disease resistance. In fact when they breed pickles even today they go back and grab the genes from National pickling for one type of virus. When the Pickle packing association got together and bred a pickle for pickling, lets just say they knew what they were doing and had more experience that all of us home growers combined. They got it right and so will you if you try it. They will never let you down. The Sumter is an old 70s updated pickling model that works equally well with slightly better d. resistance of one type of virus but I have never had much problem with either. Growing slicers just never made sense to me as they are not worth a darn for pickles but a Kirby is pretty darn good for both. Thanks, jd. I don’t think I’ve grown National Pickling; I should try it. And I’ve never even heard of Sumter. Disease-resistance is very important with cucumbers. I am looking for Agnes! I have planted my very last seeds and I have 2 plants coming up. She is a hybrid so this is my last chance for making “Agnes with Nobility” my favorite bread & butter pickle. Nobility was a long keeper Onion. I purchased the seeds from Nichols Garden Nursery. Please help me find Agnes! Hi, again, Barbara. Rose Marie says that Agnes is simply no longer available; the company that produced it has moved on. Nichols has substituted Harmonie (https://www.nicholsgardennursery.com/store/product-info.php?Cucumbewr_Harmonie-pid1856.html), which Rose Marie says is a little bigger at optimum picking size but otherwise very similar. Russian immigrants here in Oregon grew it along with Agnes last year, and they loved it. Here’s the catalog description of this F1 hybrid: 47-50 days. Harmonie is an exceptionally productive European type seedless cucumber. Grows 3”-5” in length. Parthenocarpic, sets well in cool weather and continues setting over the entire season. Short productive plants produce volumes of crisp & sweet early, dark-green fruits suitable for both pickling and fresh eating. Disease resistance to powdery mildew, scab, cucumber mosaic virus. Pollination is unnecessary, excellent variety for home greenhouse. Barbara, in case you saw a reply from me that subsequently disappeared, I must explain that I thought I found Agnes and then realized it wasn’t her after all. I will tell Rose Marie at Nichols that you are looking for seeds of this cucumber. Maybe she can tell us who the breeder was, or if Agnes has been replaced with a slightly improved variety. I think I should hire you as a recipe-naming consultant. What is noble about your Agnes pickle? thanks again! I name all my put up jobs. When I made small sweet gherkins with Agnes, I called it “Oh Sweet Agnes”. We have lamb/venison burgers and I call them “Lambie Deerest”.